It is not yet ski season in Whistler, but it is wine drinking season, so if you have some time to go to Whistler to enjoy Cornucopia, get your tickets. Here is the latest press release about Cornucopia. Enjoy. Whistler, B.C. – In just two weeks, Whistler welcomes its 22nd annual celebration of food and drink, Cornucopia presented by BlueShore Financial taking place November 8-18. With an abundance of dining events, tastings, drink seminars, and parties, there’s plenty to experience. Local Whistler restaurateurs and visiting B.C. and Canadian chefs alike have created a diverse selection of cuisines in the paired-dinner events. From the festival’s extensive list of renowned winery dinners to a cocktail-paired dinner, brewery dinner and a roving, multi-station dining experience – the biggest question will be how to fit it all in? Aura at Nita Lake Lodge is excited to showcase a special Sip & Savour winemaker dinner. 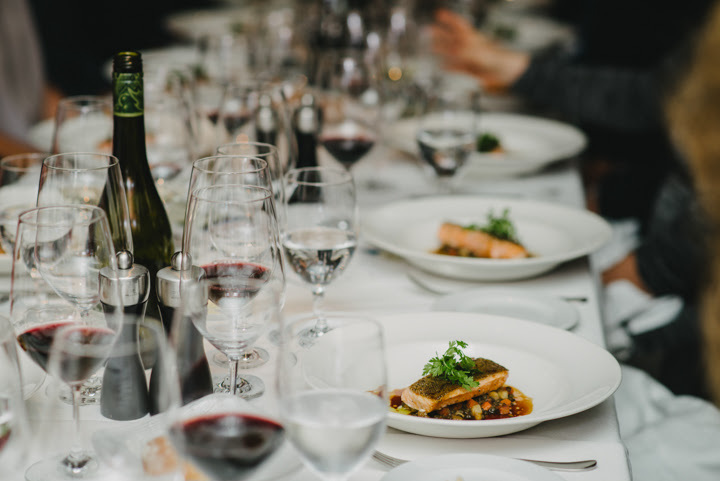 Building on the success of its summer Sip & Savour Winemaker Dinner Series – this Cornucopia-inspired dinner is an elaborate six-course menu paired with varietals from 50th Parallel Estate winery. Alternatively, visitors can reserve for a three-course dining experience paired with Blasted Church wines available daily throughout the eleven day festival. Quattro’s legendary fare will be on display at the Quattro Batasiolo wine dinner – Chef Jeremie Trottier will pair his classic Italian cuisine alongside legendary Barolo producer Batatsiolo winery. What do the Okanagan, South Africa and Napa have in common? A vineyard from each region will be featured among the three winery dinners at the Bearfoot Bistro. Meyer Family Vineyard from BC’s own Okanagan region, South Africa’s Anthonij Rupert wines and Eisele Vineyard in Napa Valley will be paired with Executive Chef Melissa Craig’s seasonal fare. BC’s Hester Creek winery has chosen to celebrate its 50th anniversary with dinner at Caramba! Ticketholders can expect an evening of canapes, four-courses and some of Hester Creek’s finest varietals. Il Caminetto makes its Cornucopia debut with three winery dinners and a new cocktail-paired dinner – Il Salotto. While sister establishment, The Cellar by Araxi, returns with the hugely successful Intimate Wine Dinner Series featuring six dinners to choose from including the celebrated Big Guns ‘Par Excellence’ showcasing the very best of Old World wines. Continuing the intimate dinner theme, the private dining room of the Fairmont Chateau Whistler’s Grill Room will feature 10 impressive dinners. Taking place over each weekend of the festival, the dinners will include themes and wineries such as Small Farms, Liquidity and Lock & Worth. Legs Diamond, located along the Upper Village stroll, is making its mark at this year’s Cornucopia with 11 dinners, one for every night of the festival. Guests can indulge in a menu of game, seafood and sweet treats all paired with BC wines. Four Seasons Resort and Residences Whistler has partnered with its colleagues south of the border to bring two exciting dinner offerings. On the first weekend, patrons can experience a collective of steakhouse chefs from four of Four Seasons’ alpine resorts – Whistler, Jackson Hole, Vail and Santa Fe – for the Four Peaks Dinner by Four Seasons. From the sunshine of Los Angeles, CUT by Wolfgang Puck located in the Beverly Wilshire, a Four Seasons hotel, will be appearing for a one-night only experience on Friday, November 16. For those looking for something more casual Savour at The Westin will servea two-hour multi-station dining experience including its coveted Poutine Bar, Truffle Mac n’ Cheese and more with BC and International wine samplings. Last but not least – if local brews are more your flavour, you’re in luck. Blacks Pub has partnered with Whistler Brewing for a four-course dinner with seasonal beers. Coast Mountain Brewing and Hunter Gather Eatery’s ‘Cask N Brat’ – a showcase of bratwurst and festive cask ale for this Novemberfest inspired evening.